If you’re looking for mattresses in Ohio, you’re in the right location. We have a collection of mattresses stores that cover the major metropolitan areas across the state. Whether you’re looking for something to save you from a lifetime of back pain, a second mattress to finish off your guest bedroom or something all natural and toxic-free, we have got you covered. 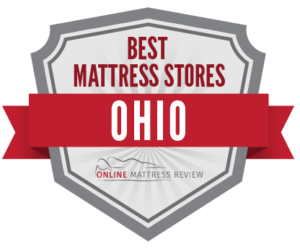 Check out some of the highest-ranked mattress shops in Ohio below. Are you looking for a mattress store in Cincinnati? Well, you have come to the right place! There are a number of locations throughout the Cincinnati area that offer affordable mattresses that fit you and your budget. The Original Mattress Factory has two locations: one on Kenwood (7336 Kenwood Rd) and one in near Mason (9853 Waterstone Blvd.). At each location you will find great customer service and quality and affordable mattresses. Sleep Outfitters (8154 Montgomery Rd.) provides a wide range of mattresses that will not break the bank. Whether you’re looking for a mattress for your dorm or something for the master bedroom there’s a little something for everyone here including quality customer service and delivery fees included within the price. There’s a separate location in Eastgate (4456 Eastgate Blvd.). Mattress Firm has multiple locations throughout and near Cincinnati. If you’re looking for convenience and quality, try Mattress Firm. Their location in Westwood (5555 Glenway Ave) is particularly known for exceptional customer service. You are in luck if you’re looking for a mattress in Columbus. Grandview Mattress (1288 Eastview Ave.) is well known as is Sleep Well Columbus. At Grandview you will find great deals for mattresses accompanied by great customer service, and free delivery. CBUS Mattress and Furniture is located in Upper Arlington (1475 Delashmut Ave.) and has a wide-range of options and a very knowledgeable staff. They use an appointment system, so it is important to book online in advance. From there a helpful staff member will allow you to try several mattresses that fit your specific sleep requirements. CBUS offers same day delivery. If you’re looking for a mattress shop in Columbus, Mack Mattress Outlet (7370 Sawmill Road) covers those who live in the Dublin area. This is a great mattress shop if you are looking for an easy and affordable approach to purchasing a mattress. If you’re in need of an organic mattress, you will find many options near Columbus. In Upper Arlington head to T.Y. Fine Furniture (4555 North High Street) for an organic non-toxic mattress or set of mattresses for your family. When in Cleveland you will have a wide-range of mattress options from which to choose including big mattress store and small mattress shops. Mattress Firm Cleveland (3356 Steelyard Dr.) offers a wide-range of mattresses from high end to budget friendly. The prices are competitive and customer service at Mattress Firm Cleveland is top notch. Additional Mattress Firm locations include Mattress Firm Fairview Park (21581 Center Ridge) and Mattress Firm South Euclid (13991 Cedar Rd.). If you’re looking to shop local, you could try Lorain Furniture and Appliance (4617 Lorain Ave.) that offers a unique collection of home goods and mattresses. The customer service is run a little differently here- much more like a mom and pop shop. You’ll be greeted with warm smiles and a knowledgeable staff that can answer all of your mattress-related needs. Fish Furniture is a well-established family-run business that originally opened on Euclid Ave in 1925. Today Fish Furniture (1443 Som Center Rd.) continues to supply quality mattresses that supply all price points. If you’re looking for a mattress shop that will supply not only the perfect mattress to fit your needs and budget but also quality customer service, try Fish Furniture. Naturpedic is an organic mattress gallery located in Cleveland (16925 Park Circle Drive.). Here you will find custom-built organic non-toxic beds to suit your needs. Customer service is excellent at Naturpedic. For not only a good, but healthy night sleep try Naturpedic. If you’re wondering: “where can I find a mattress in Toledo?” try PureSleep Mattress Store (4600 Talmadge Rd.). Here you’ll find not only a friendly sales staff, but a knowledgeable staff that ensures you find the perfect mattress to match your needs and your budget. There are no pushy salesmen here- just honest people who ensure you find a great mattress. If you’re looking for a mattress near Toledo try Denver Mattress located in Holland, Ohio (1220 E. Mall Dr.). Here you’ll find all of the trusted mattress brands you have come to know and an extremely helpful sales team. Mattress Firm supplies mattresses across the state of Ohio including Toledo (5290 Monroe St). At Mattress Firm you will find great mattresses and convenient and efficient customer service from the moment you walk in the door to the moment your mattress is delivered and assembled in-home.